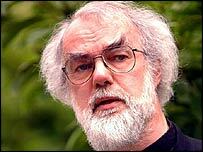 The Archbishop of Canterbury has welcomed the announcement that Prince Charles and Camilla Parker Bowles are to marry. The question of whether Prince Charles, as heir to the throne, could marry his divorced companion has caused controversy within the Church of England. It has been the subject of intense debate in Britain due to the three-way relationship between monarchy, church and state. On becoming King, Prince Charles will become head of the established Church of England. Given that both he and Camilla are divorced, it has raised thorny issues for a church that only in recent years relaxed the rules on remarrying divorcees. Though giving clergy discretion, it still opposes remarrying those whose relationship led to the breakdown of a previous marriage. 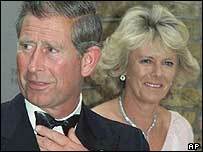 Charles and Camilla have admitted to having had an adulterous relationship while both were married. Not wanting to tacitly sanction living together outside of marriage, bishops have struggled to come up with a solution including a proposal that they remarry in a civil ceremony and then seek a blessing in church. That is what Charles and Camilla will do. Their marriage will be followed by a service of "prayer and dedication" in St George's Chapel, Windsor, presided over by the Archbishop of Canterbury, Dr Rowan Williams. While the former Archbishop, Lord Carey, caused a stir last year when he publicly urged them to marry, Dr Williams' views until now had been more opaque. He had indicated that such a marriage would not fall within church rules. Last year it was reported that he had privately consented to the marriage. The Archbishop's office released a statement on the marriage plans: "These arrangements have my strong support and are consistent with Church of England guidelines concerning remarriage which the Prince of Wales fully accepts as a committed Anglican and as prospective Supreme Governor of the Church of England." The clarification that such a marriage is within church rules is likely to be aimed at those who remain opposed to the marriage. Some evangelicals have called on the couple to "repent" from their adultery. The marriage announcement rekindles a wider debate about the role of the monarch and the established status of the Church. Prince Charles has said he wants to become the defender of faiths rather than "the faith" and a modernised coronation service is said to have been planned which would incorporate other religious traditions. Meanwhile, in recent years, more senior clergy have been questioning whether the ancient ties between monarchy, church and state should be loosened or even broken.